Released in 1992 to replace the Ford Sierra, the Mondeo was the first car to incorporate a driver’s side airbag in all vehicles throughout its history. This helped it take home the European Car of the Year title in 1994. In the run-up to the 1997 general election, Labour, under Tony Blair, targeted a specific form of voter – males from a working-class background who now lived a middle-class lifestyle, with all the associated trappings, such as a house and a car. This sub-class, who Blair wanted to attract back to Labour from voting Conservative, became known as ‘the Mondeo man’, after a conversation Blair had with one of these voters, and was key in helping Labour overturn almost two decades of Tory rule in a landslide victory. 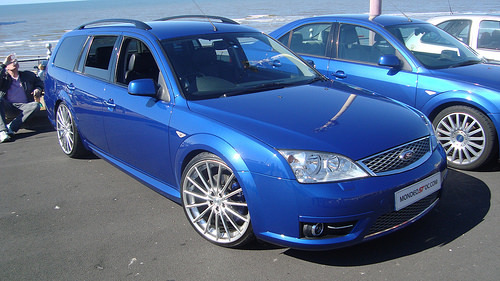 Ford Mondeo has long been a name associated with the cream of the crop in motorsport, although, of course, the vehicles you’ll see hurtling around race tracks are highly modified from those driven on British roads. Paul Radisich emerged victorious in the FIA World Touring Car Cup in two successive years in the 1990s while driving a Mondeo, while the vehicle has also been used in UK banger racing, the Argentinian Top Race series and even as the inspiration for the bodywork in NASCAR. Here at Spencer’s Car Sales, the Ford Mondeo is one of our most popular mid-range used cars. Keep your eyes peeled for the next Mondeo to hit our showroom!